The Dogs Life Nourishing Spray by Animology is a nourishing spray enriched with Aloe Vera, which moistures and conditions the skin and coat. It helps achieve a clean coat and healthy skin and is packed with vitamins and conditioners. Spray onto your dog's coat and comb through. Do not rinse. Aqua, Polysorbate-20, PEG-7 Glyceryl Cocoate, Preservative Blend, Parfum, Panthenol, Disodium EDTA, Tocopheryl Acetate, Sodium Hydroxide, Aloe Barbadensis. 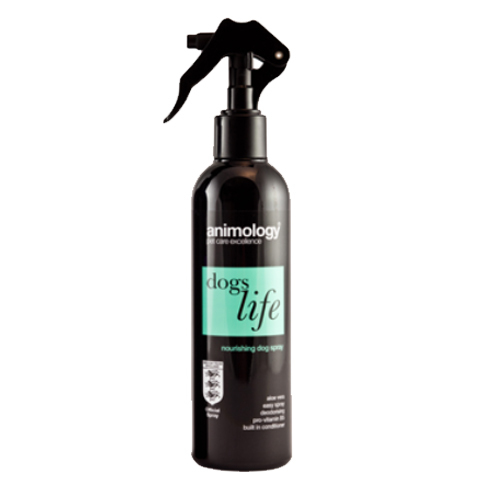 Have you used Animology - Dogs Life Nourishing Spray before? Let us know what you think about this product.